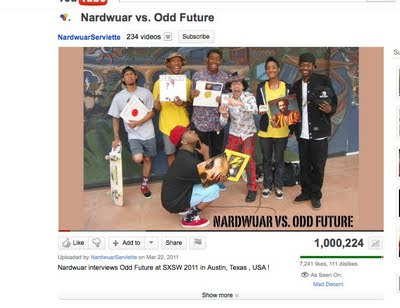 Nardwuar The Human Serviette News: 1 Million Views ! Nardwuar vs. Odd Future ! 1 Million Views ! Nardwuar vs. Odd Future ! My Odd Future interview just hit 1 million views on YouTube: Incredible! Thanks to everyone for watching! Doot doo!